Not a dry eye in the surgery. Cataract surgery is an exacting process. You rely on more than just your skill. Lenses, instrumentation and technology play a critical part in each procedure. You need them to be accurate, consistent and reliable, because you want to achieve better than half-dioptre accuracy to target every time. But no matter the skill, or the precision of the equipment, occasionally there’s a post-op surprise. We believe a significant contributor to post-op surprise is undiagnosed dry eye. Dry eye may distort the biometry results and, consequently, the cataract procedure is compromised – creating a discrepancy of up to three dioptres from target. These unexpected results are, to a large extent, unavoidable. Now there is a simple, cost effect solution. TearLab is a ‘no surprise’ package. It identifies whether (and to what extent) a patient may be suffering from dry eye by ascertaining the health of the tear film. 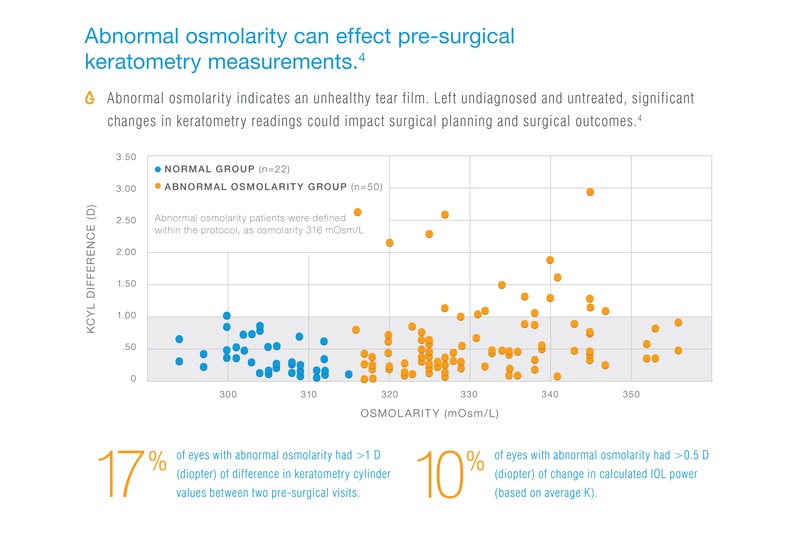 This is done by measuring tear osmolarity. It acts as a screening procedure to identify patients that have elevated osmolarity which can effect pre-surgical keratometry measurements. Left undiagnosed and untreated, significant changes in keratometry readings could impact surgical planning and surgical outcomes. By ensuring the biometry of the lens choice is optimally exact, we can therefore minimise potential refractive surprises. Whatever the result, the chance of a post op surprise has been significantly reduced.